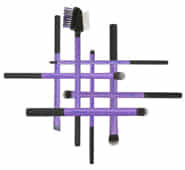 Enhance your eyes quickly and easily with the eye intensifying brushes by Real Techniques. With 3 full sized brushes and a set with a handy case, you can create stunning looks and really enhance your eyes with minimal effort. Light, easy to use and completely cruelty free. These are brushes that will completely transform the way you apply your make-up.